14th of May 2017 – wasn’t that a special day? Yes exactly, it’s Mother’s Day again! A day for saying “Thank you”, eat fabulous cake or any other activities, together with your beloved Mom. But of course we know, not everybody has his Mom very close. That’s why we wanted to show you, how you can surprise your Mommy with something sweet. 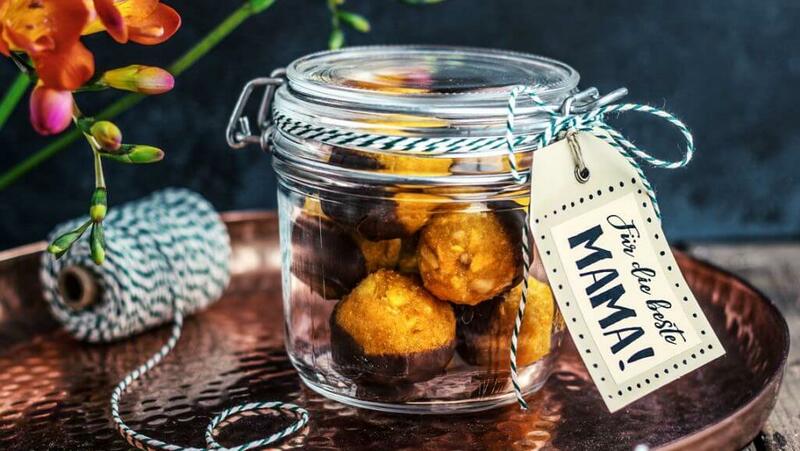 Therefor we have some juicy, delicious Macadamia-MAngo-Balls for you! The best thing about the balls is, they’re made with only 5 ingredients. You can do that easily! We placed our balls in a preserving jar, with a cute tag for your personal message. Lovely packed in a small package, you should send your MAMA-balls the next days, so the parcel arrives on time. She will love it! Put mango in a small bowl, pour water over mango and let it soak for about 15 min. Melt the milk chocolate baking chips in a water bath. Let it cool afterwards. Place the nuts on a baking tray and roast them for 5 min. in the oven. Wash the lemon and peel off the skin. Shred dripped mango, nuts, lemon and agave syrup in the kitchen machine. Form walnut-sized balls out of the mass. With the help of toothpick dunk the balls to half in chocolate and place them on a board with baking paper. Put them in the fridge to become hard. Wrap them beautifully as a gift! 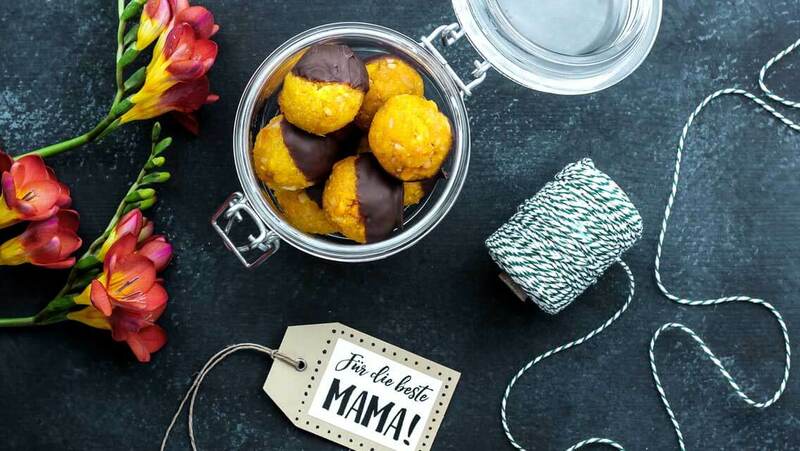 Of course you can also use other nuts and dried fruit, whatever your Mom loves. Posted in Rezepte and tagged lecker, Mama, Mango-Macadamia-Bällchen, muttertag, rezept, süß, Überraschung. Bookmark the permalink.